Does the job simply, flash bright lights with several modes. Battery indicator is a good feature. One minor downside is that the mounting feature is not symmetric and it sits further to the right or left when clamped to the seat post. 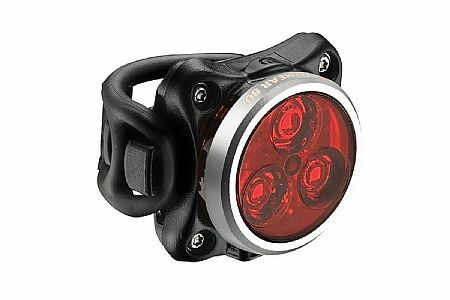 provides good blinking rear light, and attaches easily. Everything about this light is great. Too early to say if battery will last. Mostly used for day time riding. It is bright enough to get the attention of on coming cars even during the day. I bought this to replace the niterider 150, which had a big vertical footprint and poor battery life, maybe 3 hours. I like the compact design of this unit. It has many flash patterns to choose, I think 9. Stick with the last one or two, which is a nice compromise on visibility and battery life. I can get multiple rides from one charge. When charging there is a LED indicator on status. The one thing I don't like is the mounting of the unit. The back is rounded and then you use the rubberband method of attachment. My concern is the longevity of the rubber strap. If that breaks there goes the light and it's small enough you may not even hear it. I like this light a lot. It's bright, compact, and well-made. It frustrates me, though, that all these lights have rounded backs for mounting on seat posts. As a commuter, I want to mount it on my rack, because my seat post is invisible by the time I load up with my computer, change of clothes, etc. I also ride for pleasure, and on THAT bike, I LOVE this light. But why not have an option of a flat back for mounting on racks, or even attaching to backpacks and the like? One mounting system does not fit all. This is a well made & efficient light, somewhat heavy. I had to return it because the back of the light is a hard material that is shaped for a round seatpost. It kept migrating off to the side on my Giant tcr sl with an ovalized seat mast & wouldn't stay put. Because of weight & design I'd say it's best suited for commuter & casual riders with a round seatpost.